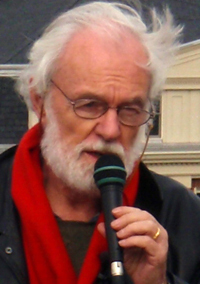 Keynote speaker is David Harvey, a social theorist and leading proponent of the right-to-the-city movement. 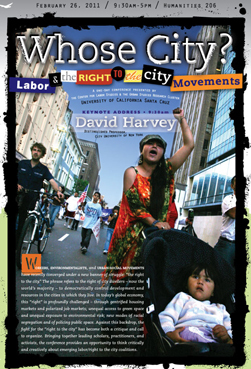 In addition to David Harvey's keynote, three panel discussions will address issues of housing, wages, and economic justice; environmental justice and green jobs; and race, class, and citizenship. Today, the majority of the world's population lives in cities. Who calls the shots? The mayor? City councils? Business interests? Increasingly, city dwellers themselves have begun organizing coalitions of neighbors, workers, and environmentalists to stake a claim toward the democratic control over issues of development and resources. A daylong conference at UC Santa Cruz on Saturday, February 26 will explore the growing urban organizing movement. "Whose City: Labor and the Right-to-the-City Movements" will feature leading thinkers and activists in the burgeoning city movement on three panel discussions on issues of housing, wages, and economic justice; environmental justice and green jobs; and race, class, and citizenship. The conference is presented by the Center for Labor Studies and the Urban Studies Research Cluster at UC Santa Cruz and begins at 9:30 a.m. at the Humanities Lecture Hall at UCSC. It is free and open to the public. Keynote speaker is David Harvey, the Distinguished Professor of Anthropology at the Graduate Center of the City University of New York. Trained as a geographer in his native England, Harvey is a widely regarded social theorist and the leading proponent of the right-to-the-city movement. His influential books include The New Imperialism; Paris, Capital of Modernity; Social Justice and the City; Limits to Capital; The Urbanization of Capital; The Condition of Postmodernity; Justice, Nature, and the Geography of Difference; Spaces of Hope; and Spaces of Capital: Towards a Critical Geography. Another participant is Kevin Danaher, a UCSC alumnus, and co-founder of Global Exchange. Co-organizer Steve McKay, associate professor of sociology and director of the Center for Labor Studies, said the conference will bring together representatives of groups that until now haven't talked with one another much -- such groups as organized labor and neighborhood organizers that are beginning to forge coalitions. "We found this great intersection" of labor studies and urban studies, McKay said. "It's a burgeoning field," said Miriam Greenberg, associate professor of sociology, and the other conference organizer. Greenberg is also director of the Urban Studies Research Cluster, a group of faculty and graduate students from a variety of disciplines whose research focuses on cities. "Whose City" is co-sponsored by the Departments of Sociology, American Studies, and Latin American and Latino Studies; College 8; and the Center for Global, International, and Regional Studies at UC Santa Cruz.